May 13, 2018, became a day to be written in golden letters for the faithful of Loiborsiret, Simanjiro! 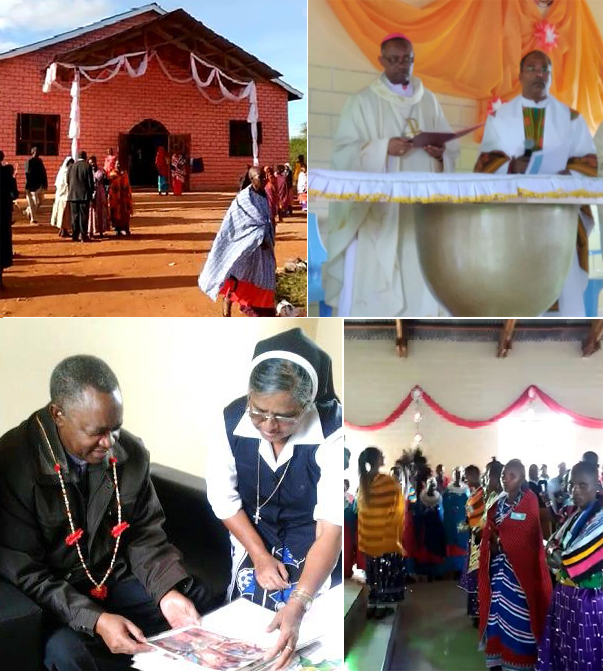 Archbishop Isaac Amani Massawe made his maiden visit to the Maasai land of Simanjiro to bless the newly completed church at Loiborsiret and for the First Communion of forty-eight candidates from various out-stations. As he stepped out of the vehicle, his first greeting was, “Oh! 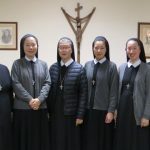 Sisters, how did you manage to reach this remote place of the diocese?” He was very pleased to notice the transformation that has taken place and expressed much appreciation and gratitude about our presence and activity in this mission. 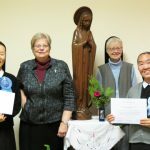 The church blessing of our out-station at Loiborsiret was especially significant for the sisters here because for years we have been praying or having Mass under the tree or sitting on stones in an unfinished church without even a proper floor. It has taken more than ten years to complete the church. Through active participation in church activities, in the Small Christian Communities, our sisters tirelessly motivated young and old to become partners in “Building our Church!” Slowly but steadily, through small contributions, people gathered the bricks, some contributing cows, goats, or sheep. The youth members each contributed a box of tiles. Bringing our Catholic women together, we were able to get some cement and other materials. Various families were encouraged to donate a bench with a kneeler on which their names would be written. Individuals came forward to donate the altar cloths, decoration materials, and other small items. Our Christian community cleared the area, painted the church, raised funds, and donated cows and goats to feed over two thousand people, including all those who came from the twenty-three out-stations under our main parish, stretching to more than one hundred kilometers. Now our colorful, well-completed church with tiled floor, forty kneelers, a beautiful altar, and an organ is the talk of Simanji, and everyone comes for the Sunday services! God be praised! 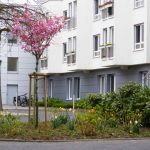 Easter Greetings from the sisters in Coesfeld, Germany! 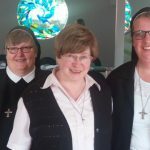 July 31 – an important date for the motherhouse!